To enable and support congregations and agencies in being a witness, a sign, and an instrument of Christ in their community. The Presbytery of Central Queensland is one of diversity and wide expanses extending from Winton and Longreach in the west; Proserpine and Airlie Beach in the north; Miriam Vale on the coast to the south, and the township of Theodore inland. The area covered is approximately 1000 kilometres west to east and 650 kilometres north to south. 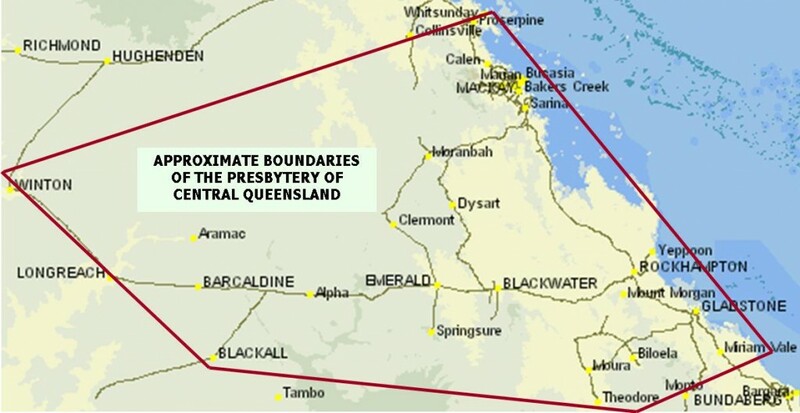 Major regional cities: Gladstone, Mackay and Rockhampton. Major towns: Barcaldine, Biloela, Emerald, Longreach, Proserpine, Sarina and Winton. Mining Centres: Blackwater, Dysart, Capella, Clermont, Middlemount, Moranbah and Moura. Much of the Presbytery consists of scattered rural communities with large distances between populated areas. Primary production industries include cattle, sheep, grain, fruit, vegetables, cotton and sugar. There is a mixture of both dry land and irrigated farmland. The mining industry draws on rich coal resources from the Bowen Basin. Tertiary industries include tourism (Whitsunday Coast and Island Resorts) and support of education (Central Queensland University has campuses in Mackay, Emerald and Rockhampton), with health care and government offices located in the regional centres. Our Presbytery Minister is Rev Dr Kerry Pierce, pictured here.